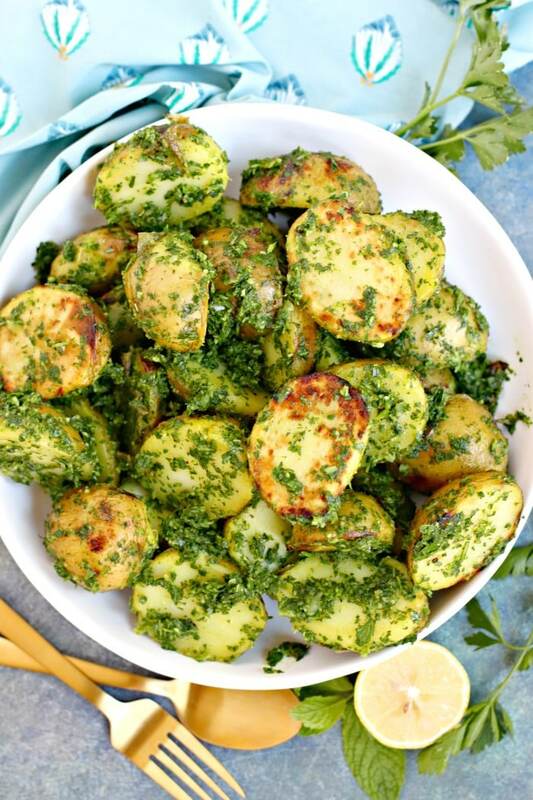 Grilled Potatoes with Lemon Herb Sauce is a delicious and healthy side dish. It’s easy to make and vegan and gluten-free. Are you a fan of potatoes? They are such a versatile ingredient. You can prepare them in so many different ways such as Air Fryer French Fries, Instant Pot Mashed Potatoes, Potato Salad, Potato Chowder, and Potato Tacos, just to name a few. But have you ever grilled potatoes? It’s really easy to do, especially when you cook them first in boiling water until just tender. Then the grill makes them brown and crispy on the outside. Add a delicious topping like Lemon Herb Sauce, and you have yourself a super flavorful side dish! 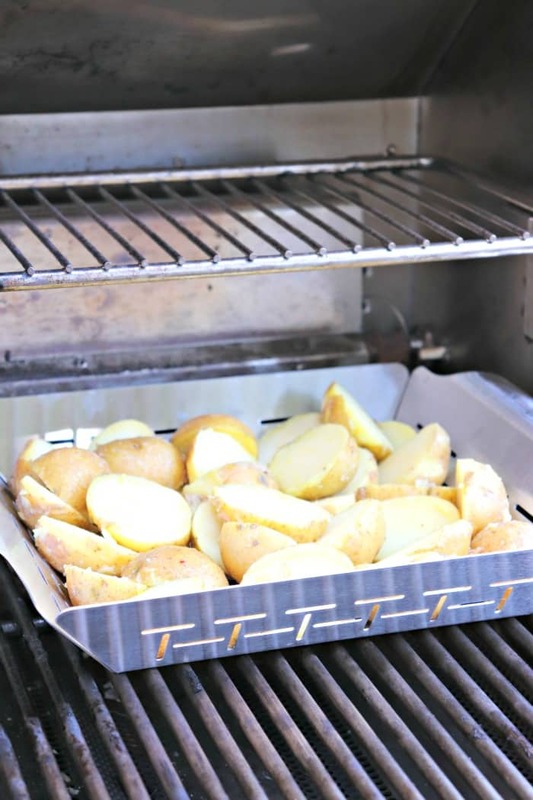 Using a vegetable grill basket makes grilling potatoes easy. As mentioned, I first cook the whole potatoes in boiling water so that they only take 5 to 10 minutes to grill. Often I’ll do this in advance, even the day before I’m ready to make this recipe. Then all you have to do is slice the potatoes in half and toss with a little olive oil, salt, and pepper. The easiest way to grill them is to put them in a vegetable grill basket which is then placed on the hot grill. This is what I like to do when grilling cut veggies and cherry tomatoes. But if you don’t have one, you can use some heavy-duty aluminum foil. However, I find the basket is a lot easier to work with and provides for better charring. Grilled Potatoes get even more flavor from an easy-to-make Lemon Herb Sauce. This sauce is like a pesto, but with different ingredients. And your food processor does all the work. Simply combine fresh parsley and mint, garlic, lemon juice, salt, and olive oil, and it’s ready to eat. I like to keep it on the chunky side so that I can still see bits of the fresh herbs. Grilled Potatoes with Lemon Herb Sauce are not only tasty, but they are highly nutritious. This recipe is high in potassium, dietary fiber, vitamin C, and iron. And if you’re worried about the oil, I recommend reading the article Plant-Based Fats: The Good, The Bad, and the In-Between by Mary Ellen Valverde, M.S. I learned that olive oil contains MUFAs (monounsaturared fatty acids) which may help prevent cardiovascular disease. In fact, MUFAs, in moderation, are a central part of the Mediterranean Diet. Grilled Potatoes with Lemon Herb Sauce go well with a variety of dishes. While I have been known to eat them as a meal on their own, I recommend trying them with a protein-centric dish and a green vegetable or salad. For example, this recipe would go really well with tofu scramble and Asparagus Avocado Salad for brunch. Or since you’ll be using the barbecue grill already, you could serve up Grilled Eggplant Salad with Chickpeas and Tomatoes and Grilled Corn Tomato Cucumber Salad. Now let’s make Grilled Potatoes with Lemon Herb Sauce! 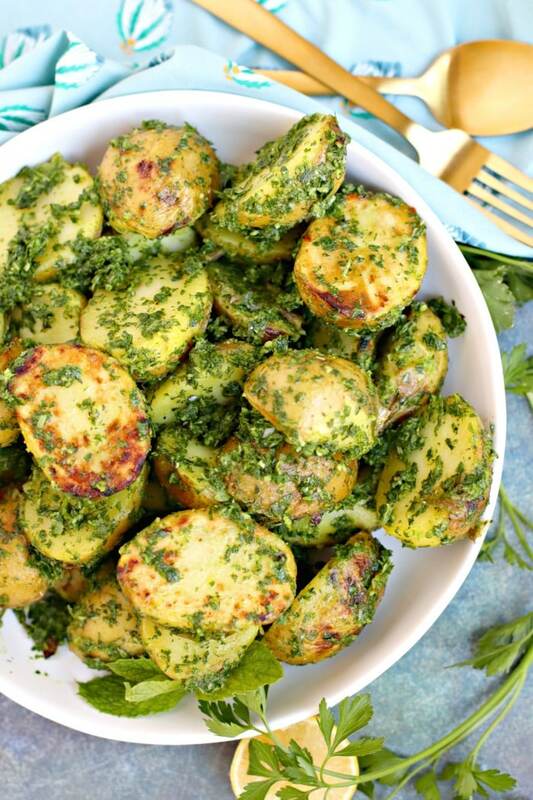 Grilled Potatoes with Lemon Herb Sauce is a delicious and healthy side dish. It's easy to make and vegan and gluten-free. Place the whole potatoes in a saucepan and cover with cold water. Add about a teaspoon of salt. Bring to a boil, then reduce the heat and simmer, uncovered, until the potatoes are tender when pierced with a fork. This step can be done in advance, even the day before. Cover and refrigerate the potatoes until you're ready to grill them. Slice the potatoes in half and place them in a mixing bowl. Add 1 tablespoon of olive oil and salt and pepper. Toss well to coat. 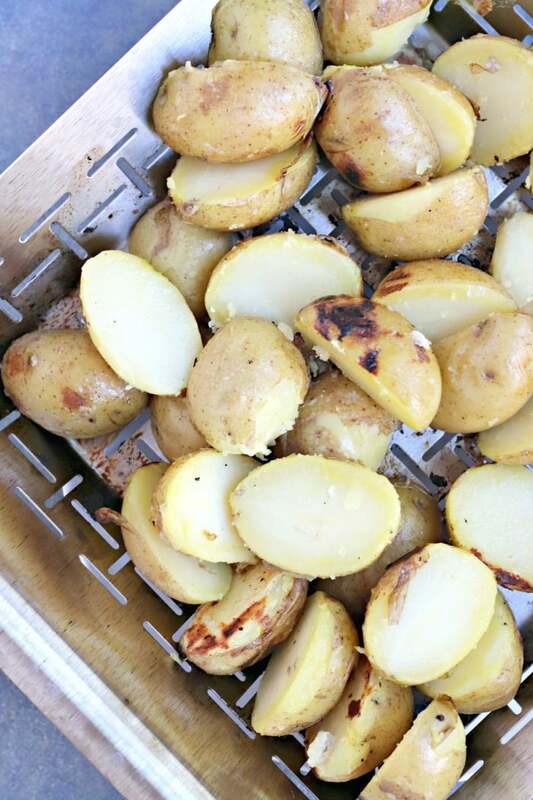 Transfer the potatoes to a vegetable grill basket. Place on a grill over high heat. Grill the potatoes until lightly browned and heated through, tossing occasionally, about 5 to 10 minutes. 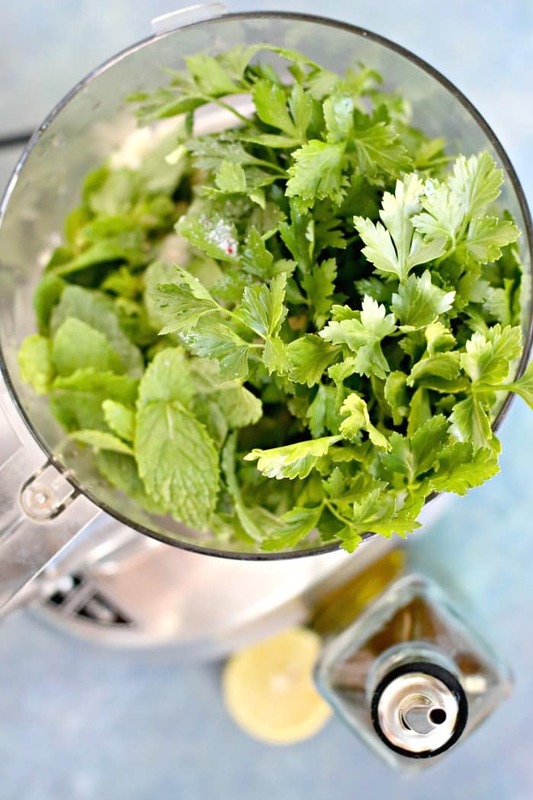 Meanwhile, prepare the Lemon Herb Sauce by placing the parsley, mint, garlic, lemon juice, and salt in the bowl of a food processor. Process while drizzling the olive oil through the funnel of the food processor. Scrape down the sides with a spatula as needed. The sauce should be chunky. When the potatoes are ready, transfer them to a serving bowl. Top with the Lemon Herb Sauce and toss to coat. Serve immediately.